Thanks for taking the time to read our UK review of the Bosch Rotak 370 LI Ergoflex Cordless Lawmower. 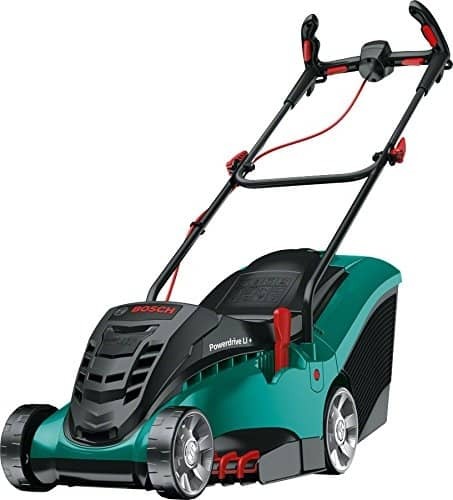 If you are considering making the switch to a cordless lawnmower, then this model could indeed be a good choice for you. As yet in the British market, cordless lawnmowers are still an expensive purchase, but there is no doubt they will get cheaper in years to come. The average good quality cordless mower will cost anything between £180-600 depending on the brand and size of the mower. The people who buy these cordless mowers are essentially looking to find a compromise. They are fed up with having to get an extension lead out, because the leads on most ordinary mowers are just too short. They also want the portability of being able to take the mower with them and perhaps to cut grass at a neighbour's home, a relative's home or to a graveyard to tidy up a plot. Now you can do all of that with a petrol mower that has a small engine. However those are noisy and they are not that good for the environment. Many of them are also hard to start, and they do need regular maintenance. The cordless mower fits nicely into that gap in the UK market, and is becoming a more popular choice, despite the initial expense involved. Now let's have a detailed look at this Bosch model, which we believe to be a very good choice for small to medium sized lawns. 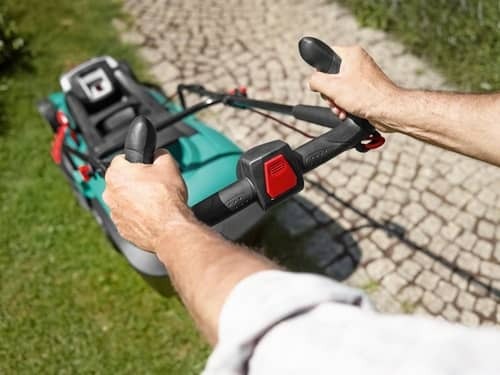 In most cases this Bosch Ergoflex 370 can get a lawn cut with a single battery charge, which will then last around 20 minutes. Bosch are of course a very well known tool brand. Aside from their high quality tools, they also make a wide range of gardening tools. These range from lawnmowers, lawn rakers, verticutters, trimmers, hedge cutters, chainsaws, leaf blowers shredders and multi-tool systems. They are a German brand and their garden products are very popular with many UK gardeners. They have 40 locations spread across the UK with over 5,000 employees. In the UK they generate annual revenues of around £3.5 Billion, with the UK being their second largest market. 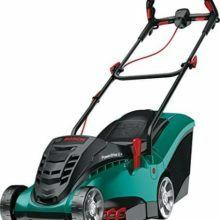 The RRP for this mower is around £400, but you can usually find this cheaper online, if you search around. We also know that around 2 out of every 3 buyers rate this mower very highly. There are over 150 online reviews for this Rotak 370 online, so we have some very useful information available to find what buyers had to say about this Bosch branded mower. We have summarised those below in an easy to read pros and cons section. CONS:- The single complaint about this mower is that the battery doesn't last long enough. In addition to this some buyers said that the battery charge reduced over time. According to buyers this mower will take you about half an hour to set up. This includes opening the box, reading the instructions and then getting the mower setup. Like many of these garden tools the instructions are just OK. In the main they are images, and a few words would have helped make the assembly a little bit quicker. Overall though most people will be able to have this mower ready in under half an hour. No tools are required for assembly as the parts attached by a click system. This machine is well made but just be aware that like most mowers these days, the outer parts of the mower are made of hard plastic. It is one of the lightest mowers with an overall weight in 13 Kg. There is a very useful handle at the top which allows you to carry the machine. The grass box fits on the back and you just need to develop the knack of clicking it on at the rear. You can adjust the grass cutting height from 20-60 mm by using a small lever. The blade is sharp and works well and it has a 370 mm cutting width. When it comes to any type of cordless tool and/or mower the bigger the battery is the better. You want ideally high voltage and high current output. That is what generates the wattage, which is of course the unit of power measurement. This Bosch Rotak 370 comes with two 36 volt batteries (2.0Ah) This Ah rating stands for Ampere Hours, and the bigger this number is the longer the battery will last. A battery takes about one hour to charge. The battery has an indicator to show when charging is finished, and also a button that will show you how much charge is left. The mower comes with a battery charger. Most mowers use 36V-40V batteries, 2.0Ah and between 1,250-1,500 watts of power. This one doesn't take up a lot of room. The handle folds down and that helps make storing this mower a great deal easier. You also have the option to quickly remove the handle if you prefer. Always remember when storing that if that storage is going to be for an extended period of weeks, (over the winter) always remember to remove the battery. 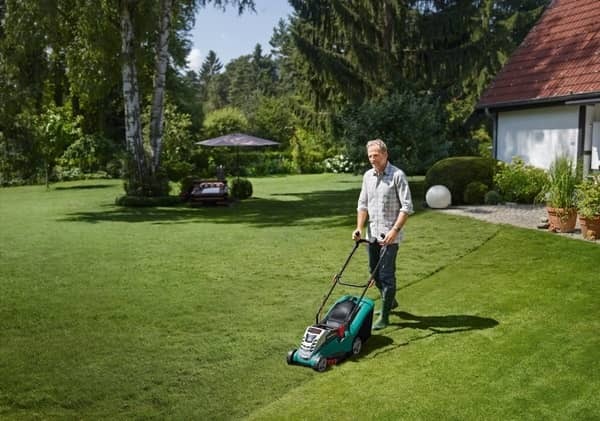 All Bosch lawnmowers and gardening tools come with a 2-year warranty. This can be extended to 3 years if you register your mower with them online. With anything Bosch branded, there is a good after service. The most likely part that will need replaced on this Ergoflex model will be the blade, and you can be sure that they will have that blade available for many years. Likewise if the batteries ever do need replaced, then they will stock those as well. In this section we like to include the full specification. You can check our top 10 list of cordless lawnmowers by clicking here. If you are in the market for a good quality cordless mower that has been tried and tested, then this Bosch model is a good choice. They do however have newer models which are the Rotak 32 LI and the Rotak 43 LI. They are all around the same price, but get slightly lower ratings. If you click on any of those links you can read about those, if you prefer a newer model. This 370 LI model does get good buyer ratings so worth considering. This mower has been released for a long time, and buyers seem to really like it. It is a good choice for a small to medium sized garden. Buyers do like the Bosch brand and they do always have parts available, a solid warranty and good customer service.